Comments: Pictured above on the front steps of The Terrace in Scottsville are the Powers, Blair, and Bell families. The Terrace is a Victorian-style residence on Scottsville's Jackson Street, built in 1897 for the Dr. and Mrs. David Pinckney Powers family. Before their home was built, the Powers family lived in the Powers House, a hotel they ran on Main Street. Dr. Powers (1826-1894), shown at right, married Sarah Staples (1831-1913) and they lived in Scottsville. He was a well respected educator and organized Albemarle County's public school system in the winter of 1870-71; he served as County Superintendent of Albemarle Schools for thirty years. Dr. Powers was a member of the Scottsville Baptist Church and superintendent of its Sunday School for many years. He was one of the presidents of the Albemarle Sunday School Association and held the office of clerk of the Albemarle Baptist Association for many years. 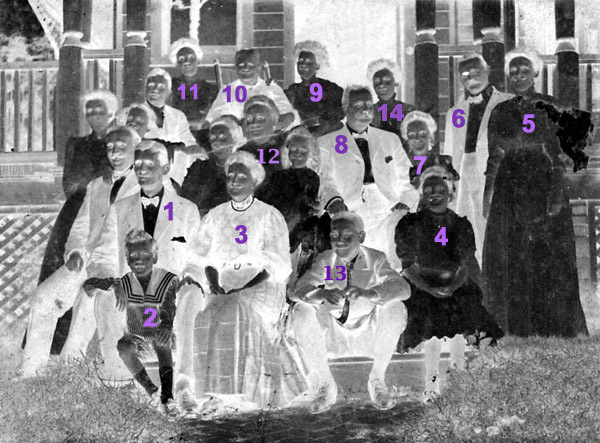 Dr. David Pinckney Powers was the deceased patriarch of this family shown above in 1907 at The Terrace. To learn more about the Powers family, use the image below as a guide to the names of family members. (1) Andrew Gilbert Bell, Sr., was born ca. 1861 in Rockingham County, Virginia and married Annie Powers (see #3) in Scottsville. They were the parents of a son, Andrew Gilbert Bell, Jr. (see #2). Andrew died in Charlottesville on October 4, 1951, and is buried in Woodbine Cemetery, Harrisonburg, Virginia. (2) Andrew Gilbert Bell, Jr., was born in 1902, and was the son of Andrew Gilbert Bell, Sr. (see #1), and Annie (Powers) Bell (see #3). Andrew passed away in 1977 in Gaston, NC. (3) Ann "Annie" Staples (Powers) Bell was the daughter of Dr. David Pinckney Powers and Sarah (Staples) Powers (see #10). She was born in Scottsville in 1864 and married Andrew Gilbert Bell, Sr. (see #1). Annie (Powers) Bell passed away in Charlottesville, Virginia, on October 8, 1951. Annie is buried in the Scottsville Baptist Church Cemetery. (4) Susie Blair, daughter of Dr. Joseph P. Blair (see #6) and Susie (Powers) Blair (see #5), was born in 1896 in Scottsville, Virginia. Susie became Professor of Speech and Drama at Hollins College in Virginia. After her retirement from Hollins College, Susie returned to Scottsville and her family home at The Terrace. Susie passed away in 1980 and is buried at Scottsville Baptist Church Cemetery in Scottsville. (5) Susan Nicholas (Powers) Blair was born in 1869 and was the daughter of Dr. David Pinckney Powers and Sarah (Staples) Powers. Susan married Dr. Joseph P. Blair (see #6) and was the mother of Susie Blair (see #4). Susan worked as a bookkeeper/clerk at the National Bank of Scottsville. Susan (Powers) Blair passed away in 1957 and is buried at the Scottsville Baptist Church Cemetery. (6) Dr. Joseph Percy Blair was a dentist, chairman of the Albemarle County School Board for 37 years, and a member of the Scottsville Town Council. He was born in Scottsville in 1864 and was the son of Captain John T. Blair and Martha (Matthews) Blair. Dr. Blair was married to Susan Nicholas (Powers) Blair (see #5), and they were the parents of Susie Blair (see #4). Dr. Blair died in Scottsville in 1931 and is buried in the Scottsville Baptist Church Cemetery. (7) Mary Bryson Powers (1893-1980) was the daughter of William Afton Powers (1854-1922) and Mary Bryson Powers (1856-1934; see #12). 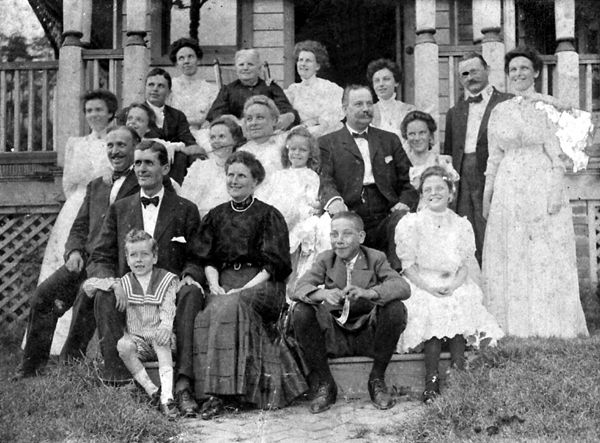 At the time of this photograph, Mary lived with her parents in Richmond, Virginia, and this family was visiting her grandmother, Sarah (Staples) Powers (see #10) and other family members at The Terrace. Mary's grandfather was Dr. David Pinckney Powers, the renown educator of Scottsville and Albemarle County, VA.
(8) unknown. possibly William Afton Powers (1854-1922), son of Dr. David Pinckney Powers and Sarah (Staples) Powers; husband of Mary Bryson Powers (1856-1934); see #12); and father of Mary Bryson Powers (1893-1980; see #7) and David Pinckney Powers (1895-1976; see #13). (9) Lucy Harrison Powers (1874-1966) was the youngest daughter of Dr. David Pinckney Powers and Sarah (Staples) Powers (see #10). Lucy did not marry and was an employee of the National Bank of Scottsville. (10) Sarah (Staples) Powers was born on July 1, 1831, and was the daughter of Thomas and Ann (Tompkins) Staples of Scottsville. She married Dr. David Pinckney Powers on June 30, 1853, and they were the parents of William Afton, Robert R., Tommy, James P., Philip Sidney, Ann Staples, Susan Nicholas, Marietta, and Lucy Harrison Powers. Sarah (Staples) Powers died on June 18, 1918, in Scottsville, and is buried in the Staples family cemetery near Glendower. (11) Miss Marietta 'Met' Powers (1871-1953) was the daughter of Dr. David Pinckney Powers and Sarah (Staples) Powers (see #10). Met did not marry and was employed as secretary to Jacinto V. Pereira, President of Scottsville's Fidelity Bank. Later, Met served as librarian at the Scottsville Library. She was a member of the Scottsville Baptist Church and its organist for many years. Met Powers is buried at the Scottsville Baptist Church Cemetery. (12) Mary Bryson Powers (1856-1934) was the wife of William Afton Powers (1854-1922), who was the son of Dr. David Pinckney Powers and Sarah (Staples) Powers (see #10). Mary was the mother of Sarah Lindsay Powers (1888-1966), William Afton Powers (1890-1892), Mary Bryson Powers (1893-1980; see #7), and David Pinckney Powers (1895-1976; see #13). (13) David Pinckney Powers (1895-1976) was the son of William Afton Powers (1854-1922) and Mary (Bryson) Powers (see #12). 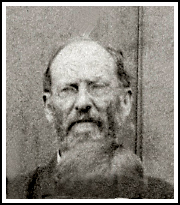 David was the grandson of Dr. David Pinckney Powers (1821-1894) and Sarah (Staples) Powers (1831-1918; see #10). The small town web of Scottsville - connecting the elite and middle class families, buildings, and social events in a cohesive community - is exemplified by the above family photograph. Taken by William Burgess around 1912 and archived by the Scottsville Museum, it shows the Powers, Blairs, and Bells on the front steps of The Terrace on Jackson Street. "They were certainly leading families of Scottsville," says Robert Spencer. "It's a great story, the story of The Terrace." This two-story Victorian house was built for Dr. David Pinckney Powers and his wife, Sarah Staples Powers. The Powers' house, from 1840, is next door to the east and is noted by Susan DeAlba's "Country Roads, Albemarle County," for its "original beaded weather-boarding." David Powers first ran "one of Scottsville's smaller, lesser-known hotels," according to Spencer. Powers was the first Albemarle County school superintendent from 1870 until he died 30 years later, "a quiet firm man of great character," said Virginia Moore. Sarah Staples Powers was part of the long-established Staples family in Scottsville that donated the land for the 1831 Episcopal Church on Glendower Road. They married in 1853 and were the parents of two sons and five daughters, the extended family all living in The Terrace, a "palace," Spencer says. The boys were William and Phillip Powers. The girls were involved in many activities in town and are mentioned by Susan Hill Dunn in her book, With Love from Mother (1934) at the Local History Center of the Scottsville Library: "The [Powers] daughters you all know: Miss Annie Bell, Miss Susie Blair, Miss Met Powers, and Miss Lucy Powers. They've been our friends always." "September 4: [Special] For some weeks, Scottsville has been unusually happy! A number of enjoyable entertainments have been given. But the 'event' of the season was a party given at the Powers house by Miss Lucy Powers last evening. The tables were beautifully decorated with flowers, fruits, and melons, and the rooms and hallways with evergreens and Japanese lanterns." "The feature of the evening was a 'potato walk,' which was most novel and amusing. To take a large knotty potato from the floor in a small teaspoon in a given length of time and carry it the entire length of a room may seem easy, but it is not." There follows a list of the prize winner and losers, and a description of the dresses worn by the women: Miss Lucy Powers, very pretty in a pale blue gown, baby waist, white lace and ribbon; Miss Marietta Powers, a debutante, blue gown and ribbons; Miss Rose Farrar, in blue veiling, white lace; Miss Theodora Blair, cream dress and flowers; Miss Auralia Blair, lovely in blue; Miss Serena Hamner, in white dress, blue trimmings, very graceful; Miss Mary Bull, white mull (similar to muslin) and ribbons, no ornaments, very pretty; Miss Jennie Patteson, black lace; Miss Nannie Davis, black net and amber, handsome...Miss Grimsley, handsome red China silk, bouquet of poppies... Miss Susie Powers, white muslin, old lace, diamond ornaments, extremely pretty..."
The men attending are mentioned by last name, but not otherwise described. Their names are a roll call of Scottsville's up and coming, or already arrived: Harris, Blair, Bell, Carter, Moore, Tompkins, Farrar, and Hill. Might they have worn stiff, high collars and three- piece suits, then gaining popularity? Or in keeping with the women's diamonds and old lace, were they more formally attired with dark tail coats and white bow ties? Did they leave walking sticks and top hats at the door? I like the idea of tail coats for the Potato Walk. This parlor game, apparently never played before in town, was one of many offered in books such as "Games for Everybody," which in the early 1900's demonstrated that children's games could be adapted to adults; included were Tableau Vivant and Forfeits. This type of fun was evolving from the harsh days of the Civil War and its aftermath, and from earlier social stereotypes that allowed children to play games indoors, but not adults. These parlor games, offered in a special formal room set aside for entertaining, clearly shows a society with more leisure time on its hands. The workers were working, of course--the farmers, railroad hands, lumber and coal men, the many domestic servants and laundresses--but the wealthy were, when not reading, sketching or playing music and games. "Blind Man's Bluff; Charades; Pass the Slipper; Squeak, Piggy, Squeak--these were somewhat boisterous, sometimes creative activities we still might play today, like Musical Chairs. They do have an aspect, in a more circumspect society, of 'decorous titillation,' as the website, Victoria's Past, points out. Squeak, Piggy, Squeak, for example, involved a blindfolded player who the Farmer turned around until the player became disoriented in the center of a circle of seated players. The Farmer drops a pillow in the lap of one, sits on it, and then commands, "Squeak, piggy, squeak," and tries to guess in whose lap he is sitting by the sound. Not quite 'Spin the Bottle,' but on the way! As the Foxfire Book of Appalachian Toys and Games (1993) notes, "Nothing levels people as effectively as a good laugh at themselves and others in the same funny situation." The Courier article did not say if Mr. Frank Hill, awarded the booby prize in the Potato Walk at Miss Power's house, was laughing. Following Scottsville history down the years, we find a number of Lucy Powers' party-goers pairing off and marrying. Miss Lucy did not. 'The Famous Miss Lucy,' Spencer calls her; she ran a nursery school with a teaching friend who lived with the family at The Terrace, Miss Kate Stith; and Miss Met -- Marietta Powers -- her aunt, remained single and worked "at the tiny little library next door to the Methodist Church," Spencer says, and as the secretary to Scottsville banker, Jacinto Pereira. Annie Powers married A. Gilbert Bell, uniting those families; and Susie Powers--she of the white muslin, old lace, and diamonds--married Scottsville's dentist, Dr. Joseph Blair, whose office was on the second floor of a now-vanished frame building on the south side of Main Street, next to Mink Creek. Blair's ad ran in a 1911 Scottsville Enterprise: "will visit Alberene, Schuyler, and Esmont." He was chairman of the Albemarle County School Board for 37 years and a member of the Scottsville Town Council. Joseph Blair is remembered in John C. Hill's memoir, Recollection of Scottsville, 1870-1886, as "embodiment of everything that a young man should be... [He] was a clerk in the Harris [grocery] Store, and his salary was $30.00 a month [but] he had his heart set on becoming a dentist." To make enough money for medical school tuition, Hill remembers, Blair asked his friend, Thomas Staples Martin, "a power in politics long before he became United States Senator," to help him get a job as a railway clerk, which gave him "a run from Charlottesville to Hinton, West Virginia... Joe saved money fast on that job..." After graduating from University of Maryland dental school, Blair took his friend Hill as his "first patient--he filled a tooth for me." Some of Blair's dental tools came to Robert Spencer from Hayden Anderson who found them in the attic of The Terrace when he bought that house. Susie Powers Blair's daughter was always known in Scottsville, with great respect, as "Miss Susie." Susie Nicholas Blair, 1896-1980, was remembered by Virginia Moore in a Scottsville Baptist Church history supplied by Spencer, as "growing up in a large family--parents, aunts, uncles, cousins--this 'only child,' unspoiled, must have been, as prophecy of the future, an earnest young person with a quick sense of humor." She taught English, drama, and Shakespeare at Hollins College and was well-loved in Scottsville as a member of the Scottsville Baptist Church where she directed the Christmas pageant; was original member of the Board of Trustees of Scottsville Museum; an helped stage the ambitions Bicentennial Pageant with Spencer and Randolph Phillips. "Wise," Virginia Moore said, "with the wisdom which comes not from books...but from life itself." Susie is also remembered by Virginia Moore for many of the games that were played in her childhood, including 'Drop the Handkerchief' outdoors at Cliffside, Virginia's home. Miss Susie, last of the family to live in The Terrace, stipulated that it was to remain the home of Charlie Lenaham, who with his mother had been servants there and "took wonderful" of the Power and Blair families," says Spencer. The Scottsville Museum's website describes The Terrace as a "storehouse of artifacts and memories" of Scottsville and these intertwined families. As author, Michael Ondaatje, writes, "The past is always carried into the present by small things." Dental equipment, a corsage of poppies, and a Potato Walk."